Marine veteran Art Petty Jr. received special recognition for his service in three wars, WWII, Korea and Vietnam. At age 93, Petty was the oldest veteran to win recognition at the annual Cannon County Veterans Day ceremony. "Thank you for your service. That is what we say today," guest speaker Tony Burnett told the gym full of students and honored guests at the annual Veteran's Day service at Cannon County High School. Burnett, former Woodbury Police Chief, reminded the audience they need to keep in mind the great sacrifices made by America's military. The annual event featured a number of highlights including special presentations to the family of slain soldier 1st Lt. Frank B. Walkup IV and to the family of Harold Alton Basham, who died in Vietnam. "I want to challenge you today, because you are the ones who can make a difference in Cannon County in the patriotism people see in our citizens," Burnett told the audience. "There are men and women who are not here today, and there are many who are here today, who paid a great price. They left their home, their families and their friends to go to places that most of us would run away from," he said. Burnett cited Cannon County's response to the death of Lt. Walkup as an example of the strong support the community gives the nation's military. "I have seen patriotism first-hand right here in Cannon County. As we mourned with the family of 1st Lt. Frank Walkup IV, the streets of Woodbury were lined with American flags and the citizens showed their commitment and dedication to a man and his family who died for his country," he said. The day of Walkup's funeral reinforced Burnett's pride in Cannon County. "I was so proud to be from Cannon County. It was a day we put our differences aside. It was a day it didn't matter what side of politics you were on. It was a day the flag not only rose high on the flag pole, but flew high in our hearts reminding us of the the sacrifices our founding fathers made today as well as in the past," he said. "We should be reminded and always remember that when we are at war or when we are at peace, our flag stands for the best," Burnett said. Burnett's speech preceded Ann McBride's presentation of "The Quilt of Valor" to Frank Walkup in honor of his son, Franz Walkup, who is still recovering from serious wounds he suffered in Afghanistan. Walkup is also the father of Lt. Walkup, who was killed in combat in Iraq. Two other Walkup sons, Josh and Jake, took part in the following presentation of special Killed in Auction (KIA) banners to their father and the family of Harold Basham. Vietnam veteran Britt Knox told of the origins of the flags and explained the significance of them. Many of the veterans at the event rallied to the playing of their service songs by the CCHS band and assembled on the gym floor. Col. Jim Stone passed a microphone to each veteran who told their name, rank and area of service. "It's sad to see the dwindling numbers of World War II vets," Stone said before giving a special introduction to retired Marine Art Petty Jr. 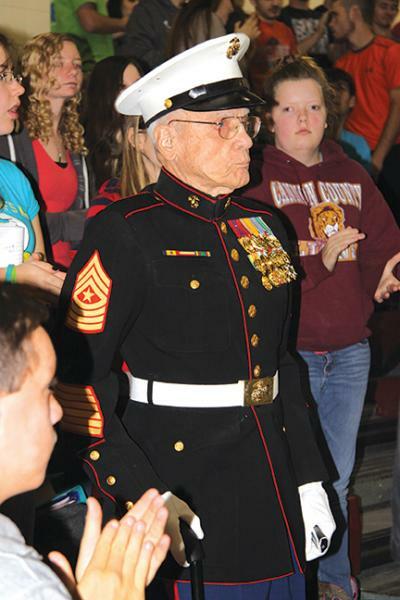 The 93-year-old Petty was decked out in his full Marine uniform. Marine Sergeant Major Petty survived three major U.S. wars ... starting with WW II in the 1940s, being called back to active duty during Korea in the 1950s, and in 1965, the Marine landed in Chu-Lai Vietnam. Following lunch, the veterans toured the high school which was decorated with Veteran's Day art and photography.